Cleaning supplies are under the case, inside the case cover. 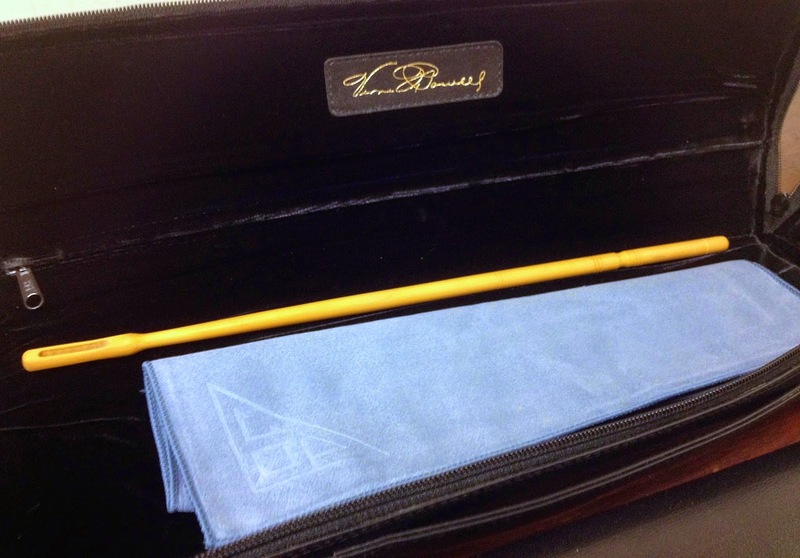 When you purchase a new Powell flute, you'll notice that it comes with a microfiber polishing cloth, a swabstick, and a gauze swab. 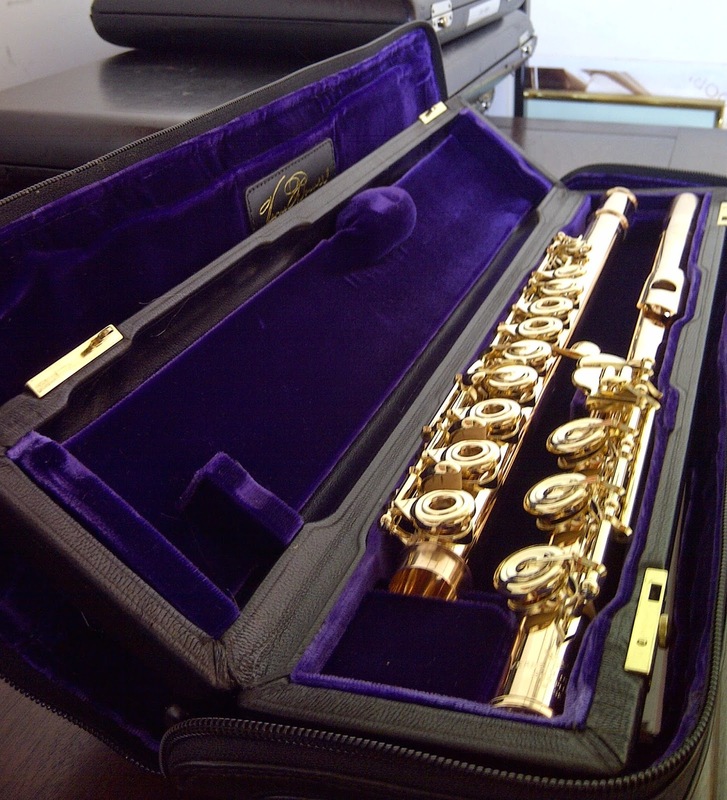 It's essential to your flute's well-being to keep it clean and use these items everyday, making sure to swab out the flute thoroughly and use the cleaning cloth to wipe off the flute after you play. It seems elementary, but these basic steps of flute maintenance should help keep your flute healthy and prevent issues that might occur in flutes that are not cleaned regularly and properly. The cleaning items that come with your flute each have their own longevity, so we spoke with Powell's Director of Service and Quality, Rebecca Eckles, about finding replacements for these items when the time comes. In a previous post, we discussed how you can clean the polishing cloths and swabs (follow this link to read that post). However, we realize that eventually, these items will need to be replaced -- or perhaps you would simply like to have extras. Luckily, each item is available through the VQP Shop on the Powell website. Ciick here for the link to polishing cloths, here for the link to swabs, and here for the link to swabsticks. These links take you directly to the flute supplies, but swabs and swabsticks for piccolos are also available in the VQP Shop. Follow this link for a one-piece piccolo swabstick and this link for a two-piece piccolo swabstick. Silk piccolo swabs are also available -- follow this link to view them. We realize that the gauze swabs will probably be the first cleaning supply that needs to be replaced, and Rebecca mentioned that you could use something other than gauze. She currently uses small pieces of t-shirt material as a swab for her flute and told us that you could use this or any material that is 100% cotton, absorbent, and soft. As simple as it seems, it will do the trick. And remember, do not use any treated cloths for the inside or outside of your flute. Keeping your flute clean will make a world of difference. Cleaning supplies that come with a new Powell flute: swabstick, swab (inside cloth), and polishing cloth. Gauze swab inside the polishing cloth. My Powell didn't come with a gauze swab.